James Frakes, M.D., M.S., could have chosen many places for his medical studies. But the southern Illinois native chose Rockford, where he graduated in 1976 from the University of Illinois College of Medicine, 1601 Parkview Ave. He was one of 26 students to make up the school’s second graduating class. Frakes went on to have a very successful career as a physician. Last year, he retired from private practice with Rockford Gastroenterology Associates, Ltd., where he served as managing partner for more than 20 years. He’s past president of the American Society for Gastrointestinal Endoscopy and has been an adviser to Congress, the Health Care Financing Administration and various federal commissions. Frakes has received many awards from the College of Medicine at Rockford, including the Distinguished Alumnus Award. He credits his success, at least in part, to time spent at the medical school both as a student and professor. “My experiences and memories here have just been wonderful,” he says. “The College of Medicine at Rockford has been an extremely valuable part of my medical professional life. Founded in 1971 as a regional medical program for the University of Illinois, the College of Medicine celebrates its 40th anniversary this year. The Rockford campus is one of four University of Illinois campuses in the state; the others are located in Chicago, Peoria and Urbana-Champaign. The program offers education to second-, third- and fourth-year medical students, who spend their first year at the University of Illinois at Urbana-Champaign. 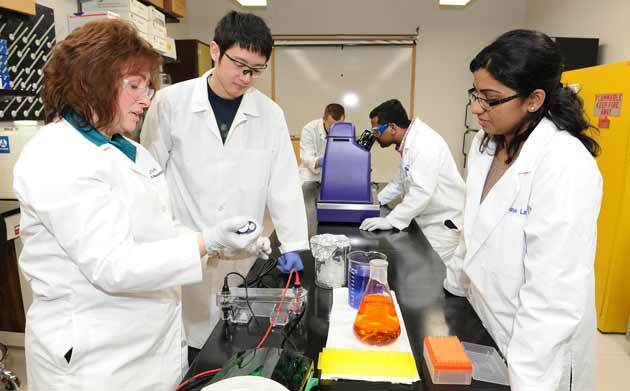 In addition to medicine, the campus has graduate programs in pharmacy, nursing and public health, and offers a master’s in medical biotechnology. The college is affiliated with Rockford’s three hospitals and also provides medical care to the general public. It has trained more than 1,300 physicians, with more than 300 Rockford graduates practicing in Illinois. Last year, students were matched to 13 different residency specialties in 18 states. The faculty has 750 members, 60 full-time in specialties from biomedical sciences to surgery and pediatrics. Most of the faculty members are community physicians who work in private group practices, and who teach primarily for the gratification of training the next generation of doctors. Dr. Glenn Netto is one such physician. A Rockford native who graduated from Rockford West High School and Rockford College, before graduating from the College of Medicine in 1980, he returned after his residency, because of the medical school. The medical school combines academics with an extended clinical experience. Students interact with patients in one of three university primary care clinics, starting in their second year. By the fourth year, each student is responsible for the care of 75 to 100 local families. 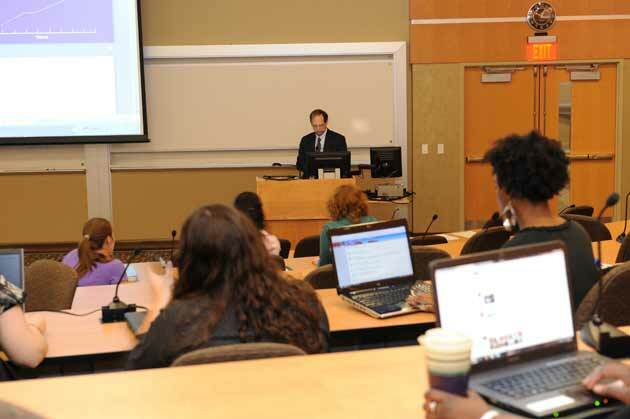 Through innovative research, the faculty at the College of Medicine has made significant contributions to the practice of medicine, from studies on cancer and neuroendocrinology in the department of biomedical sciences, to investigations of community-based health initiatives by the National Center for Rural Health Professions (NCRHP). 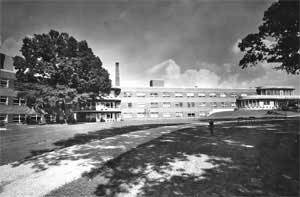 The Rockford Municipal Tuberculosis Sanitarium opened on the site in 1916, one of hundreds nationwide designed to isolate patients and slow the spread of the disease. In 1993, the Rural Medical Education (RMED) program began training physicians for underserved rural areas. Part of the NCRHP, it’s one of the most successful programs of its type in the United States. The school often gets requests from other schools and hospitals for advice on developing similar programs, and has multiple international visitors from China, Mexico, Ireland and Thailand, who seek guidance on rural medicine training. The College of Medicine also serves the general public with clinics throughout northern Illinois. The medical school has primary care clinics in Belvidere, Mt. Morris and Rockton; a Women’s and Children’s Health Center on McFarland Road in Rockford; the L.P. Johnson Family Health Center at Ninth and State streets in Rockford; and a psychiatry clinic at Parkview Avenue in Rockford. The school’s medical library, located at Parkview, is part of the University of Illinois library system, with access to the full electronic resources of the University. It’s open to the public and has research librarians and staff who can assist with searches for both medical and non-medical-related information. The school’s location at 1601 Parkview Avenue in Rockford has come a long way since it served as a tuberculosis sanitarium, from 1916 until the late 1960s. The college was established in 1971, when a group of community physicians encouraged leaders at the University of Illinois to develop a medical school at the former sanitarium. The group promised that community physicians and local hospitals would commit time, energy and resources to providing the clinical education. Initially hired to do an impact study, Cowen was the third staff member to come onboard after the medical school opened. He soon led the Health Systems Research unit and became well-known throughout the region for his expertise on demographic and social trends. He organized hundreds of studies, helping organizations to analyze community needs in order to implement programs. The College of Medicine has had five deans. The first was Dr. Robert Evans, followed by Drs. Craig Booher (interim); Clifford Grulee, Jr.; Bernard P. Salafsky; and Lipsky. Still, there were financial concerns, especially in the early years, according to the book, A New Generation of Physicians, written by Stanley Olson, M.D., who served as a volunteer assistant to the dean. Persistent underfunding of the school by the state increased pressure on the College of Medicine to find new ways to increase income from the delivery of clinical services. A $26 million building expansion, completed in the summer of 2008, has allowed the college to expand its programs. That’s evident when one pulls up to the front door of the college. The college broke ground on a state-of-the-art, $26-million expansion project in summer 2008. The College of Medicine campus is home to the new University of Illinois Health Sciences Campus at Rockford. It houses the NCRHP, a new regional college of pharmacy, the campus’ college of medicine, the college of nursing and the master’s in medical biotechnology program. The 58,000-square-foot expansion includes a tiered, 100-seat classroom; a 200-seat auditorium for lectures, interactive classes, community meetings or seminars; a standardized patient suite for training healthcare professionals; a 6,500-square-foot laboratory suite; new space for the Crawford Library, with a commons area; a two-story atrium; and a first-floor lobby. When Lipsky was hired away from Northwestern University, in Evanston, Ill., seven years ago, one of his goals as dean was to increase the school’s visibility in the community. He likes telling the story about the time he came to town to interview for his current position. “I stopped at a gas station to ask for directions and one of the attendants had never heard of the school,” he says, laughing. Lipsky has since beefed up the school’s marketing and public relations efforts. Staff members are more accessible to the media and are available to speak on numerous topics, from health care industry issues and medical education, to various diseases, biomedical and clinical research topics. The Dean’s Council functions as the advisory board to the college, using the members’ professional and personal involvements to establish and maintain relationships with regional leaders, philanthropic agencies and other institutions throughout northern Illinois. Fifteen community members serve on the Council. Fox has served on the Dean’s Council for nine years and chaired it for the past four. Fox has also served on the Rockford Health System Board of Directors for 20 years. In the coming 40 years, Lipsky says, the college will place more emphasis on interprofessional education. Even with a promising future, challenges lie ahead. This entry was posted on Friday, October 14th, 2011 at 11:57 am	and is filed under Mind & Spirit. You can follow any responses to this entry through the RSS 2.0 feed. Both comments and pings are currently closed.